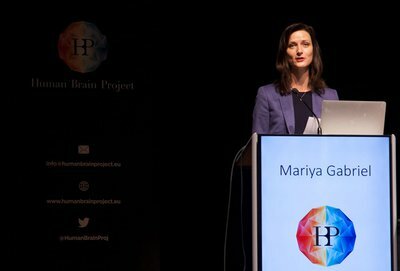 On 16 October the Human Brain Project had the honor of welcoming Mariya Gabriel, European Commissioner for Digital Economy and Society, in Maastricht to the first day of its annual meeting, the HBP Summit. In her welcoming message, the Commissioner stressed the importance of strengthening the economy by pushing AI, High Performance Computing and digital skills in European research and expressed her strong support for the HBP’s work. After her speech, Commissioner Gabriel went on a guided tour through the exhibits of the HBP Open Day, which on 15 October showcased some of the HBP’s scientific and medical achievements, and exposed latest developments and tools to hundreds of local students, scientists and the general public. The Commissioner took the time during her visit for discussions with the experts presenting work from the various research areas. HBP scientists explained new achievements in neuroscience, medicine and information technology which are driven and catalyzed by the growing HBP Research Infrastructure, as well as its commitment to ethical research, and activities for citizen engagement done by the Project. Exhibits included animations explaining the uniqueness of the HBP Research Infrastructure, the two neuromorphic (brain-inspired) computing hardware used in the HBP, “SpiNNaker” and “BrainScaleS”, and a model of the WhiskEye robot, which explores its surroundings in a way similar to rats. We thank Commisioner Gabriel for her visit and support! 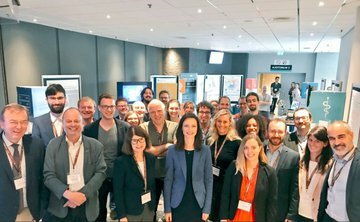 The 3-day Human Brain Project Summit is the yearly full meeting of the HBP, which unites the work of more than 500 scientists from 121 institutions in 20 nations. This year it is hosted by Prof. Rainer Goebel, an HBP contributor from Maastricht University.